For years Star Wars fans could only dream about the events of the Clone Wars and Anakin Skywalker's fall from grace, as first introduced in the original Star Wars trilogy. The power of the dark side that seduced Darth Vader, the legendary piloting skills of Luke's father, it was all only spoken about, until George Lucas announced plans to finally bring Episodes I, II, and III to life, promising to show us the first meeting between Obi-Wan and Anakin and the fateful duel that turned the newly minted Darth Vader into "more machine than man." And George Lucas needed to find perfect actor to play the role. Which wasn't an easy task by any means. There were hundreds of screen tests before Lucas enlisted young Jake Lloyd to play the future Darth Vader in Star Wars Episode I: The Phantom Menace. To say the performance wasn't well received is putting it mildly; perhaps no other character in Episode I has been as derided, save for of course Jar Jar Binks. Sadly, Lloyd's post Star Wars life has been filled with trouble, of the legal and psychiatric kind. Lloyd had at least one A-list defender, though. Director Ron Howard. He actually wrote a letter to the editor of Newsweek defending both the film and its young star against negative pre-release buzz, writing, "Jake Lloyd is terrific in the film (which, by the way, is truly amazing)." Howard, of course, was drafted some 18 years later to direct another Star Wars prequel, the standalone Han Solo movie. The man who plays Anakin's male heir has come to Lloyd's defense, as well. Mark Hamill told an interviewer at the 2017 Sundance Film Festival that he was, "still angry about the way they treated Jake Lloyd. He was only ten years old, that boy, and he did exactly what George wanted him to do. Believe me, I understand clunky dialog." The role of the adolescent and young adult Anakin eventually fell to Canadian born actor Hayden Christensen. He "won" twice at the Golden Raspberry Awards for Worst Supporting Actor for the part, but hey, he did manage to grab Best Villain at the MTV Movie Awards and made the list in People's 50 Most Beautiful People. Love them or hate them, the hindsight has been more kind to the prequels than many of us may realize. In fact, both Star Wars: Episode II: Attack of the Clones and Star Wars: Episode III: Revenge of the Sith maintain "Fresh" ratings on Rotten Tomatoes. Revenge of the Sith made close to $850 million dollars when it was released in 2005. Christensen hasn't appeared in too many high profile roles since, though he did marry his costar from the movie Jumper, Rachel Bilson, beloved by nerds everywhere as the Wonder Woman costume sporting Summer on TV's The O.C. Speaking of teen soap operas, in the years since the prequels, the role of Anakin Skywalker has been voiced by Matt Lanter from the rebooted 90210 series, in both the well-received Clone Wars television series and more recently Star Wars Rebels. But not so long ago, in this very galaxy, Lucasfilm reportedly considered some 1500 actors for the role before deciding on Christensen. Here we take a look at five of the better known people who nearly got the chance to face-off against Ewan McGregor. Hey, weren't we just talking about teen soaps? Joshua Jackson, famous for playing Pacey on Dawson's Creek, nearly nabbed two massive roles back in the day. He was one of the last four or five guys to screen test for the role of Bruce Wayne in what became Christopher Nolan's Batman Begins. In a 2000 interview with CNN, Jackson admitted he'd met with the casting director for Attack of the Clones, though he was quoted as saying, "me and every other white male actor between the ages of 14 and 30." Interviewers constantly asked him about the role around that time. "I don't really know that there's much of auditioning process for this," he added. "I haven't been approached by Mr. Lucas. Though I would not turn down the job, believe me." It was also heavily rumored at the time that Jackson's TV costar, Dawson himself, was in the running for the role. In 2017, James Van Der Beek said he'd recently discovered there may have been some truth to the rumors after all, though he would have been too busy with his commitments as the star of Dawson's Creek. The role of Batman in the rebooted Dark Knight trilogy eventually went to Christian Bale. But around the same time that Joshua Jackson's name was getting tossed around as a possible Anakin Skywalker, Bale's name was in the running, too. The Guardian newspaper in Bale's native England noted that the then-26 year old Bale was, "the latest young actor to come down with a case of Star Wars speculitis." 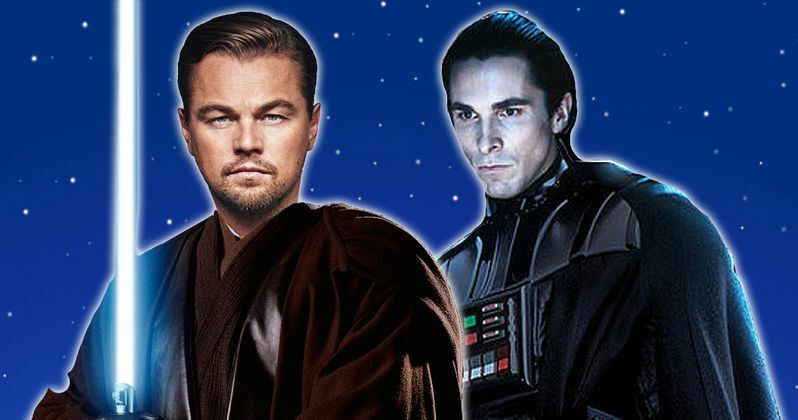 There are more Oscars and nominations between Christian Bale and Leonardo DiCaprio than original hands left on Luke Skywalker or his father, for that matter. DiCaprio was nearly Spider-Man back when James Cameron wanted to direct. He reportedly turned down the role of Robin opposite Val Kilmer in Batman Forever. And in 2015, while promoting The Revenant, he opened up about passing up Star Wars. "I did have a meeting with George Lucas about that, yes," he says of Anakin Skywalker role, adding that he "just didn't feel ready to take that dive, at that point." By the turn of the new Millennium, Leonardo DiCaprio had already made What's Eating Gilbert Grape?, The Basketball Diaries, Romeo + Juliet, and some little movie called Titanic. But years before the Fast and Furious franchise was revived as a mega billions success, the late Paul Walker was best known for his roles in teen dream fare like Varsity Blues and She's All That. Walker was passed over for Anakin, reportedly because he appeared too old to act against 19 year old Natalie Portman, whose Queen Amidala was supposed to be around 25 in Attack of the Clones. Despite Entertainment Weekly described him as a "teen hunk," Walker was 26. In 2010, Paul Walker and Hayden Christensen actually appeared together as bank robbers in the ensemble action crime thriller Takers. Ryan Phillippe, at the time referred to as "Mr. Reese Witherspoon" by Entertainment Weekly, won a reader's poll by a wide margin against both of the Dawson's Creek guys as well as General Hospital's Jonathan Jackson, no relation to Joshua. Of course, it would take more than a reader's poll to convince George Lucas, but Phillippe was definitely close to getting to wear that Padawan braid in his hair. In a 2008 interview, he revealed that he had, in fact, not only met with George Lucas, but even went so far as to read for the part alongside Natalie Portman. As with Walker, the age difference was an obstacle. "I think it was sort of an age thing in their mind," said Phillippe, who would have been 27 when Attack of the Clones came out. More than ten years after the release of Revenge of the Sith, Hayden Christensen received a standing ovation from fans when he turned up at Star Wars Celebration in Orlando, Florida in 2017. He was even a good sport about one of Anakin's most infamous lines, the whole "sand" thing. And hey, it's not like he wrote it! And for all of the haters who are angry that Christensen was inserted into Return of the Jedi? Hey, it's stock footage. Hayden had no idea George was gonna do that. Speaking of Force Ghosts, we didn't see one in The Force Awakens. And Rogue One was Hayden Christensen free, too, even during that awesome bacta tank scene. It is very possible that we will see a Anakin Force Ghost in The Last Jedi. But we'll have to wait until this December to see if the prodigal Jedi returns.